Straight teeth are an asset to your confidence and your oral health. Not only do they look amazing, but they also contribute to a comfortable bite and easier oral hygiene. They can also reduce the risk of tooth breakage and premature wear and tear. If you have misaligned teeth, we encourage you to visit us for an Invisalign® consultation. This remarkable orthodontic treatment may be able to give you the smile you’ve always wanted without subjecting you to the hassles of traditional braces. Your teeth are attached to your bone via small ligaments, which give your teeth the ability to move a tiny bit at a time. Orthodontic treatments leverage this natural capacity for movement by applying gentle pressure to teeth to reposition them over time. 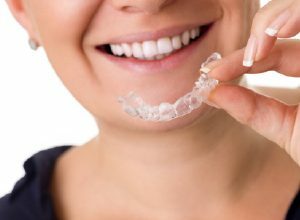 Traditional braces use brackets and wires to accomplish this, but Invisalign® in Abington uses a series of clear thermoplastic aligner trays instead. If you are a good candidate for this treatment, we’ll send detailed images and impressions of your teeth to Invisalign®, which will then fabricate your custom aligners. You’ll wear each tray for 20 – 22 hours each day for about two weeks before you graduate to the next aligner. Each one will move your teeth a little closer to their ideal positions. No dietary restrictions. Since the trays are removable, you’ll simply take them out of your mouth at mealtimes. You’ll therefore be able to enjoy any food without worrying that it will compromise your treatment. Easy oral hygiene. The removable nature of Invisalign® allows you to brush and floss your teeth according to your normal routine; there is no need to navigate around a bunch of brackets and wires. Maintain a professional appearance. Although the Invisalign® aligners are not completely invisible, they are discreet and allow their wearers to smile with confidence. 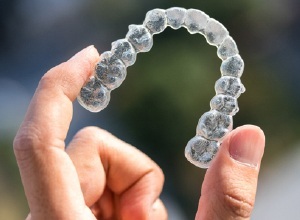 Invisalign® has no wires to irritate the soft tissues in your mouth. Fast results. You may begin to notice a difference in the way your smile looks after just a couple of months. The average total treatment time is about one year. Quick checkups. You’ll need to visit your dentist in Abington periodically throughout your Invisalign® treatment. These checkups are usually very short in duration. The best way to find out if Invisalign® is right for you is to schedule a consultation in our office. After we examine your mouth and talk to you about your goals and circumstances, we’ll make a treatment recommendation that we believe is the best fit for you. In general, Invisalign® is appropriate for most adults with mild to moderate orthodontic problems, such as as crooked teeth, overbite, underbite, and gaps between the teeth. During your consultation, we’ll also discuss things such as the cost of the treatment, financing options, and what daily life is like with Invisalign®. Once you have all the facts in hand, you can determine whether you are ready to embark on your journey to a more attractive, healthier smile with Invisalign®.